President Donald Trump signed a measure Tuesday that would enact new tariffs on residential washing machines and solar cells imported to the United States. The tariffs on solar modules and cells start at 30 percent in the first year and gradually go down in subsequent years. For washers, there’s a 20 percent tariff on the first 1.2 million finished washers imported, which jumps to 50 percent for all washers above that number in the same year, according to the Office of the United State Trade Representative. The initial tariff for washers drops each subsequent year by 2 percent. 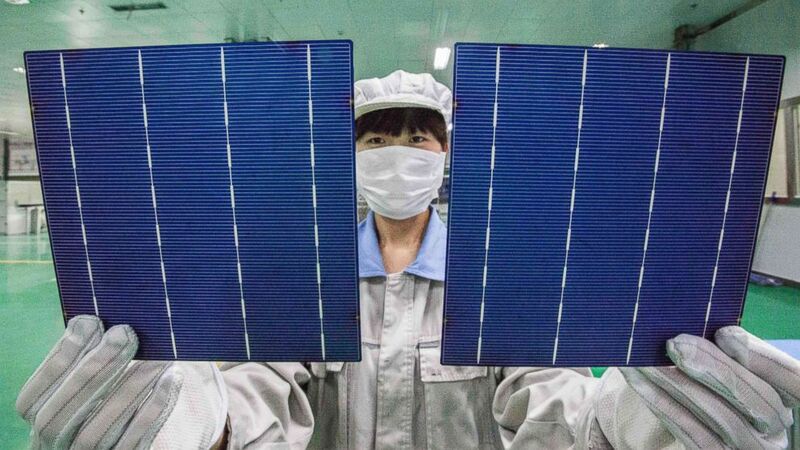 A Chinese worker shows photovoltaic cells to be used to make solar panels at a solar manufacturing plant in Lianyungang city, east Chinas Jiangsu province, China, Oct. 21, 2014. ‘Modest’ price increase for some washing machines? The International Trade Commission’s recommendations to the president said there would likely be a “modest increase” in prices for washing machines as a result of the tariffs and that fewer machines would be imported, which companies said could result in fewer choices for consumers. The decision to add tariffs to imported washing machines comes after Whirlpool filed a petition alleging that Samsung and LG were selling washing machines in the U.S. at prices lower than in the companies’ home countries, a practice known as “dumping.” Whirlpool claimed that the companies moved their washer production to countries like Vietnam and Thailand to continue selling cheap washers in the U.S.
Whirlpool said in a statement that the decision will result in new manufacturing jobs in states like Ohio, Kentucky, South Carolina and Tennessee. A Whirlpool spokesman accused overseas companies of not having consumer interests at heart and said they were trying to force domestic companies out of the market with below-cost prices. Samsung and LG, both companies based in South Korea, said the decision could raise the prices of their washing machines in the U.S. or make choices more limited. Samsung said in a statement that “everyone will pay more, with fewer choices” because of the tariffs. LG said in a statement that it was too early to speculate on price changes for consumers but echoed Samsung by saying that consumers could see more limited choices when it comes to LG brand washers. Both companies said they have or are in the process of opening manufacturing facilities in the U.S.
A man installs solar panels on a home in Falmouth, Maine, Aug. 2, 2017. Solar energy companies said that the tariff will actually hurt the industry and potentially eliminate 23,000 jobs due to declining demand and lost investments. In 2016 renewable energy sources like solar and wind made up 10 percent of energy consumption in the U.S., according to the Energy Information Administration. The tariffs the president signed into effect today came after Suniva Inc., a solar manufacturer in Georgia, filed a petition asking the International Trade Commission to look into whether so many solar cells were being imported that it hurt the domestic industry. Suniva is now owned by a Chinese company, Shunfeng International, and the other company that joined the petition, SolarWorld Americas Inc., based in Oregon, is the U.S. branch of a company based in Germany. Suniva declared bankruptcy in 2017 and has asked for extensions on its bankruptcy filings, according to Reuters, because trade tariffs would be an essential part of restructuring the business. The Space Needle towers in the background beyond a container ship anchored in Elliott Bay near downtown Seattle, Feb. 15, 2015. But 27 other manufacturers asked the U.S. trade commission not to implement the tariffs, saying that the tariffs would more than double the price of solar panels, hurt demand and, in turn, threaten jobs at factories in the U.S.
Dan Whitten, communications director for the solar industry group the Solar Energy Industries Association, said the companies are counting on the tariffs. “These companies have nothing to live for except the tariffs which will bail them out,” Whitten said. A nonprofit energy group called the Rocky Mountain Institute said Tuesday that 35 solar industry groups have committed to developing a low-cost solar product to offset any price increase when the tariffs go into effect. ABC News’ Jordyn Phelps and Ali Rogin contributed to this report.